Learn how to make strawberry cheesecake with a difference with the strawberry margarita cheesecake recipe you'll see here! Cheesecake texture, strawberry margarita flavor! It's a strawberry margarita recipe with a cheesecake twist! Eat it cool from the refrigerator, like a drink, or warm from the oven, like you might any other cheesecake! It's great for any time of the year! You're gonna love it! Moving on to the cheesecake filling, the first thing to do is to soften the cream cheese (a few seconds in a microwave will do this quickly, but only run the microwave just long enough to soften it). Next, mix together all the remaining ingredients except the all-purpose flour and the salt. Once these are fully mixed together, add the all-purpose flour and mix thoroughly again. 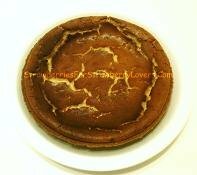 After this, remove the crust from the refrigerator and pour the cheesecake mixture into the crust. Place another 9 inch (23 cm) diameter pan, filled 3/4 full of water, on to the lowest shelf of the oven and preheat the oven to 375 degrees Fahrenheit (190 degrees Celsius). Place the cheesecake on to the second lowest shelf of the oven. Allow the cake to bake at this temperature for 10 minutes, then reduce the temperature to 250 degrees Fahrenheit (120 degrees Celsius) for an additional 50 minutes, or until a wooden toothpick inserted into the center of the cake comes out clean. When you are ready to serve the cheesecake, you may optionally sprinkle a little kosher or margarita salt on each slice. A truly great cheesecake! Just one more hit you could find here at StrawberriesForStrawberryLovers.Com, Home of the World's Happiest Fruit!